Add fast SATA storage to your laptop or PC. There are times when adding additional drives to your laptop or PC just isn’t an option. 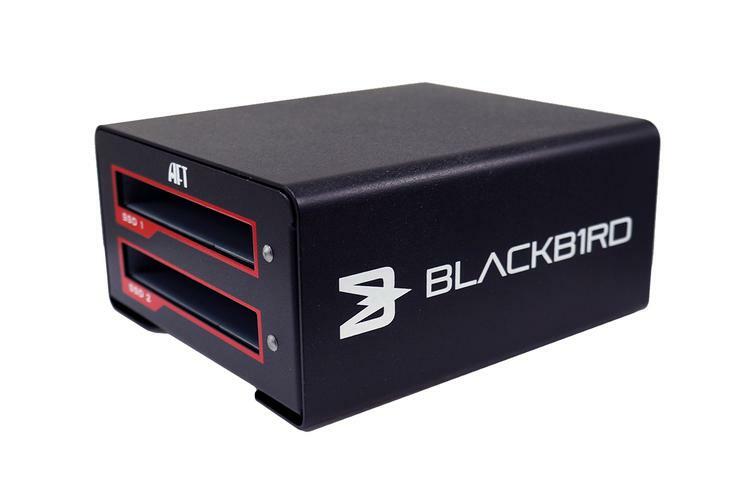 That doesn’t mean you have to make due with less storage, or even compromised performance from an external solution, as Atech Flash’s Blackbird VX-2SSD proves. 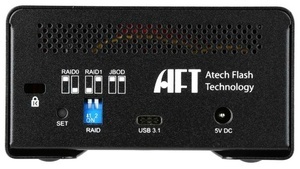 This dual-bay, 2.5-inch, external USB 3.1 enclosure lets SATA drives perform as quickly at the end of a cable as they would inside your computer. Kind of liberating, if you think about it. Of course, that’s assuming your laptop or PC has 2nd-generation, 10Mbps USB 3.1 on board. If your PC doesn’t have it, you can add it easily enough with a $35 PCIe card. If your laptop lacks it, you’ll have to live with 5Mbps USB 3.x. The VX-2SSD (which has an MSRP of $149 but can be had for about $10 less on Amazon) is a rather small, but extremely sturdy, approximately 4.6-inch long, by 2.2-inch high, by 4-inch wide black box. Styling is limited to the red accents around the front-accessible drive slots, and logos on the front and side. A fair amount of pressure is required to insert and remove drives; perhaps more than you might comfortable with at first. But you’ll get used to it, and a wee struggle now and again is certainly better than your drive popping or dropping out in mid-write. A lot better. The back of the VX-2SSD is home to a single USB 3.1 (Type C) port, the AC jack, a RAID-mode DIP switch, and a reset button. To configure or reconfigure the unit, you set the DIP switches to the desired mode: RAID 1 mirrored, RAID 0 striped, or JBOD, which in this case results in dual drives; then press and hold the reset button for about five seconds. There’s a legend for the dip-switch settings printed on the back of the drive. Nice touch. I had no issues setting up the VX-2SSD for the first time, but it seemed that when I wanted to change from RAID 0, to RAID 1 or JBOD, the unit would no longer mount—i.e., show up in Windows. After reinitializing both drives, then partitioning them while directly attached to the motherboard, things were hunky-dory again. Atech Flash was as puzzled over this as I was, but I have a talent for making things misbehave, largely based on impatience. Go figure. The VX-2SSD performed as expected—like a SATA RAID array. We used two fast OCZ Vector 180’s configured in RAID 0 (striped) and saw 591MBps reading and 791MBps writing in AS SSD. Most enclosures are faster readers than writers, but we do see the reverse occasionally, depending on chipset and drives. Note that the same drives mounted in the Akitio Thunder3 Duo Pro performed in the more common manner. 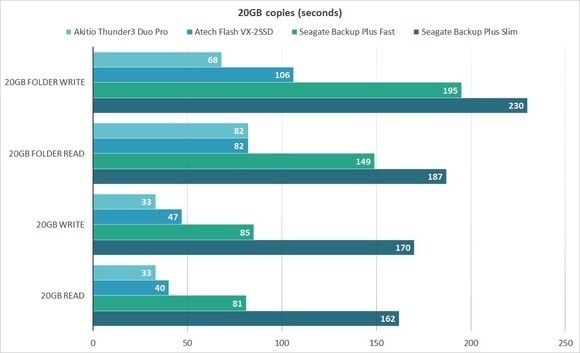 Regardless, the VX-2SSD is a heck of a lot faster than a single internal SATA drive, as fast as dual-drive internal SATA RAID 0, and anything we’ve seen from USB 3.0. 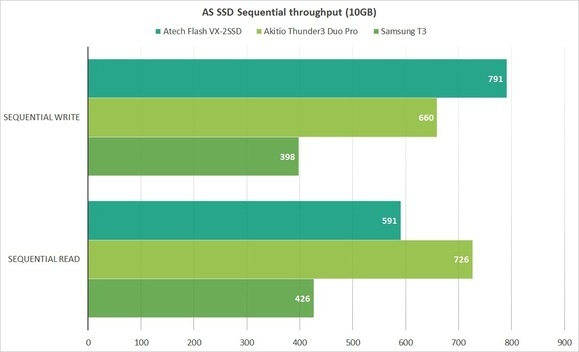 The VX-2SSD is an extremely fast writer, though read performance was slower than with the Akitio Thunder3 Duo Pro. The VX-2SSD is a worthy competitor for the Akitio Thunder3 Duo Pro, and at considerably less than half the price. Note that we used an Asus X99 Deluxe motherboard with the Asus Thunderex 3 PCIe expansion card for connecting the VX-2SSD. The VX-2SSD is a great little product that allows you to leverage any type of 2.5-inch SATA media to best effect. I can see using it for data recovery, backup, and a host of other chores besides simple storage. It’s easy to use, and at $149... Okay, I was hoping for $99, but it’s still a fast and highly versatile enclosure. And certainly a lot less expensive than the Thunderbolt 3 SATA enclosures we’ve seen so far.